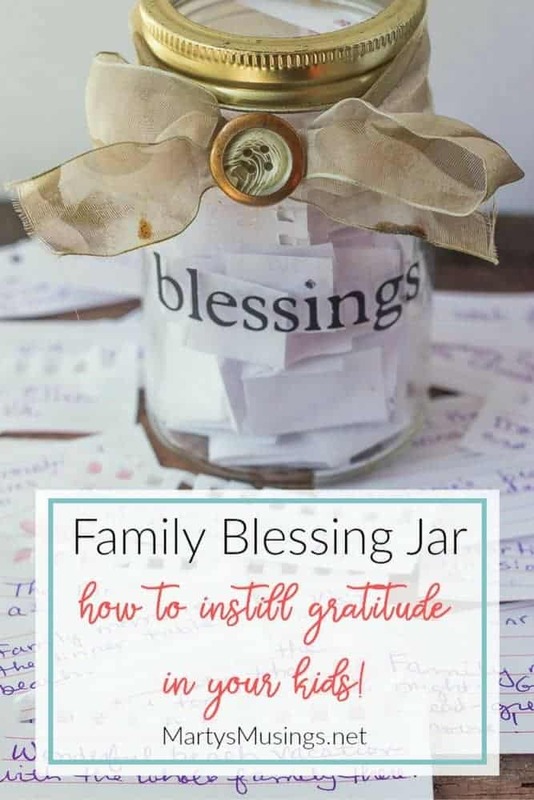 The family blessing jar tradition is a precious way to instill gratitude in your children with the simple act of recording blessings throughout the year. Do you ever feel pulled by the demands of family, job, school, church or outside activities? Of course you do! You are probably especially feeling the pull of this busiest season of the year as we race towards Thanksgiving, Christmas and New Year. I will be honest and say that this year as a work at home/homeschooling mom I’m busier than ever. I constantly have to refocus, adjust my priorities and ask for help! How do you keep from drowning in the commercialism, busyness and demands on your time? For our family it is a matter of reconnecting with our roots and remembering cherished family traditions. Our family blessing jar is a tradition that goes back to 1999. At that time we only had two children and couldn’t possibly have imagined the changes the next few years would bring, with both joys and trials. Our family expanded that next year to include 3 adopted children as well. Our most cherished family tradition occurs on Thanksgiving Day. We have lunch at our house for our family (our kids, my niece and family.) Late afternoon then finds our immediate family meandering up the street to Wagoner’s Tree lot, where we have picked out our tree every year for more than 15 years. 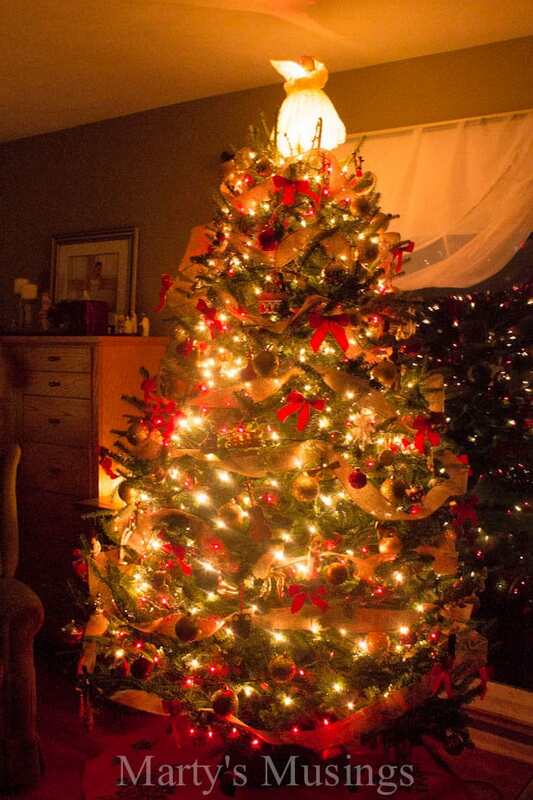 We come home, drag the tree in the house and start decorating. Point of Grace Christmas CD must be playing and Russian tea must be served. It truly is the highlight of our year, a tradition we hold to tightly and joyfully. There is much jostling and joking as we decorate the tree. Specific rituals have to be followed and mom has to take pictures. Once the tree is decorated we gather around our table and take out our blessing jar. This special little jar sits on our kitchen table year round, reminding us to take time to appreciate God’s blessings, both small and large. No special paper needed. Any scrap will do! 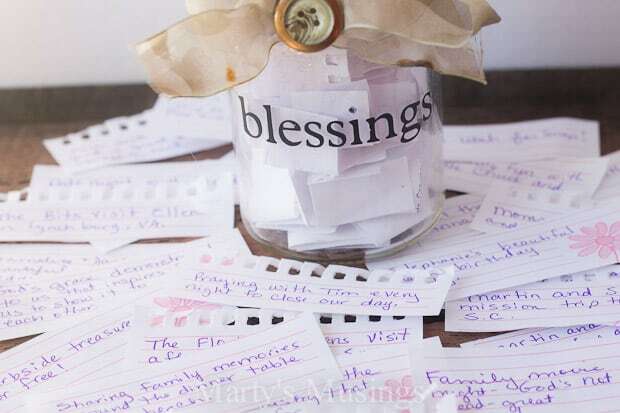 We then go around the table and one by one open the slips of paper from our family blessing jar, seeing the treasures of our lives laid before us. As we read from the past year we are always reminded of the ways God has taken the good and bad times and turned them into family memories, a tangible picture of God’s love for us. I cannot begin to tell you how we look forward to this time. As our family ages and changes we welcome new members and treasure those to come in future years. Our culture of family traditions didn’t start overnight but are the culmination of years living life together. Where do you start? Take one day at a time and try these tips for instilling gratitude in your children. Start young. Even small children can be taught to say thank you to God through their prayers, songs and words. Reinforce. Point out to your children the many ways you are thankful to God for His provision, His love and your family. Model a thankful heart. Tell your children and spouse thank you for the gift of their lives each day. Encourage your children to say thank you and “catch” each other doing acts of service. As the children get older, have them look up scriptures on thanksgiving and write the verses out. Use them in art projects or special presents for friends and family members. 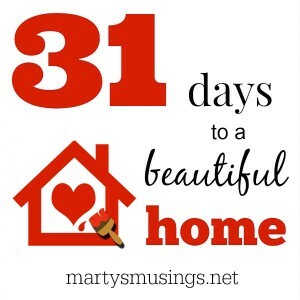 Have you joined me for my 31 days series yet? It’s not too late to follow along! Wow, this is such a good idea and a must-try for all families I believe. Not all families started rich, this includes us. But we have lots of things to be thankful of, me and my husband sometimes are just busy making money to think of the good things we already have. I know this isn’t good so I think your blessing jar idea is really worth a try for us this year! we have done other activities to express thanks but this jar is a must for a new beginning in our new home. of course my curiosity is about the portion of your jar not shown in the photo. Do you use the lid and make a slot in it for placing the papers in or just leave the lid off ?? Hi, Brenda. We actually don’t use the lid at all and just stash the papers in there throughout the year whenever we think of it. Curious, did each member contribute something each week,or whenever they felt they wanted to? Just wondering how it was utilized throughout the year? Hi, Kim. We always keep the jar on the kitchen table so every so often at dinner we would ask them what they were thankful for and write it down. As the kids got older, into their teens, we might give a reminder but by then the habit was developed and they did it on their own. Plus, you didn’t want to get to Thanksgiving and not have any slips in the jar!